Costumes that are show stoppers. Exceptional Costumes. Exceptional Service. Exceptional Prices. 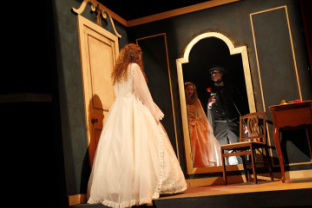 All Dressed Up is a premier theatrical costume company committed to serving the performing arts. We can provide you with a single spectacular outfit for a lead character, or an entire production of costumes to suit your individual needs. We offer an affordable rental program to assist with meeting budget requirements, and with over 70,000 costumes to choose from, All Dressed Up can accommodate even the largest cast, while allowing each theatrical production to have its own distinctive design appearance. All Dressed Up is continually buidling new sets of costumes and select pieces to keep our stock fresh and updated. If you have a specific design requirement or idea, All Dressed Up's talented staff can custom build costume to your specifications to rent or own. The staff of All Dressed Up consists of specially trained costume designers dedicated to helping your production staff create a look that is tailored to your individual vision. We ship to customers across the country, and plan ahead to insure that your costumes arrive in time for your technical dress rehearsals. We ship via UPS which is cost effective, and we request that you return via UPS to insure delivery to our building.